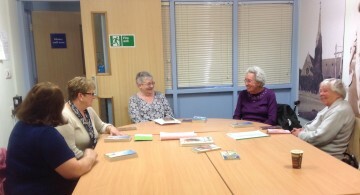 The Book Group meets on the first Monday of every month at Eastwood Library at 11 o’clock. We have read a wide variety of books including A Thousand Splendid Suns, Mill on the Floss, Eleanor of Acquitaine, The Help, Animal Farm, The Kite Runner, Gone Girl and The Cellist of Sarajevo. When we have read the book we discuss it and it is interesting to realise that a book we particularly enjoyed may not have been to other peoples taste. It all makes for interesting discussions. Each month a new set of books is borrowed from the library. Not all books are popular with everyone and no-one has to persevere with a book if it’s not to their taste; the main aim is to enjoy reading and share that enjoyment with others. It’s good to share and it’s fun.